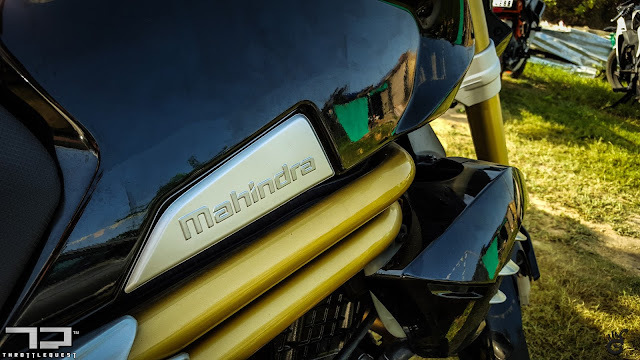 When we got our first glimpse of the Mahindra Mojo, back in 2010, just before the Auto Expo, well, it was nothing short of revolutionary. The closest machine we had during that period was the Kawasaki Ninja 250, which was, a 250 cc parallel twin mill, but now, we had something of a 300cc mill (which was pretty exciting back then), with a twin exhaust setup, querky front end, petal rotors and many other goodies. But that was 2010 and this is 2015, that's half a decade worth of time, and time is not constant, and nothing around it is either for that matter. As the variables around time would have it, today, time presented an impromptu opportunity to ThrottleQuest to sample if the MTW Mojo has found it's Mojo in real world. Well, to sum it up, the Engine Engineering S.r.l developed 292cc single cylinder DOHC engine is a blast to ride. I have never come across a Single Cylinder Engine (apart from the KTM Duke 390), that revs up with such fire. I was able to red line the engine in every gear, before I had to slow down because of the on-coming traffic. This is one rev happy mill, which just loves to blast through the revs as quickly as possible. The result - well, with each shift up, the Mojo charges ahead like a mad raging bull, as if there's no stopping. Yes, the engine is that good. There are mild vibes, but then hey, this is a single cylinder mill without a counter balancer, but still, the Mojo does an amazing job in masking the vibes and the performance that's on the tap, would keep you enticed enough to ignore what ever vibes might be there. Also, the exhaust note is a deep rumble, something I liked immensely. 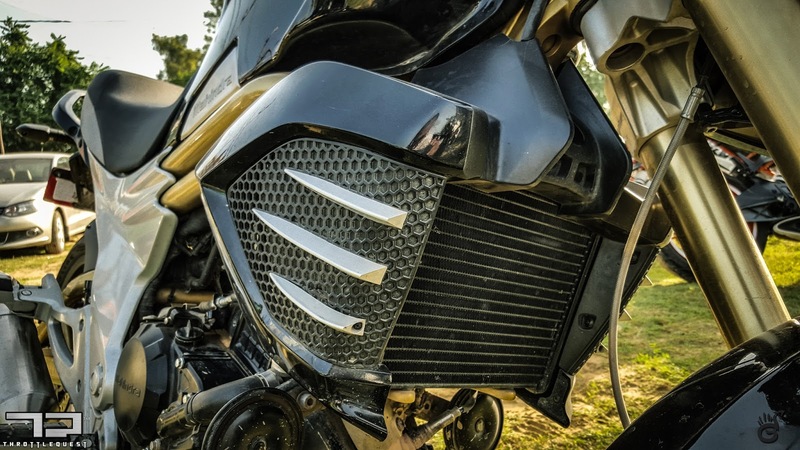 We were told that there would be a separate baffle setup available as accessory which would make the exhaust note even more throaty. The gear box is equally smooth and bliss, specially the upshift. For the downshift, there were a couple of times, when I lost a bit of a feedback specially coming down from 2nd to 1st. Talking about downshifts, I have to talk about the Engine braking of the Mojo. I for one use Engine braking a lot, and the Mojo inspires a lot of confidence over there. The Engine braking is strong and brings down speed levels down exponentially, so much so that rear tends to lock up pretty easily, but nothing out of control. 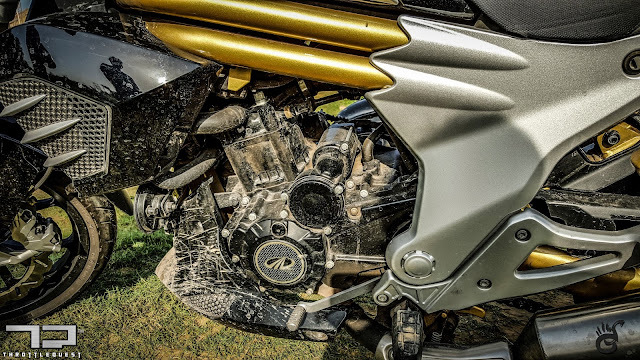 While I was super exciting about the engine, I was left wanting for a bit more when it came to handling of the Mojo, specially the front end feedback. 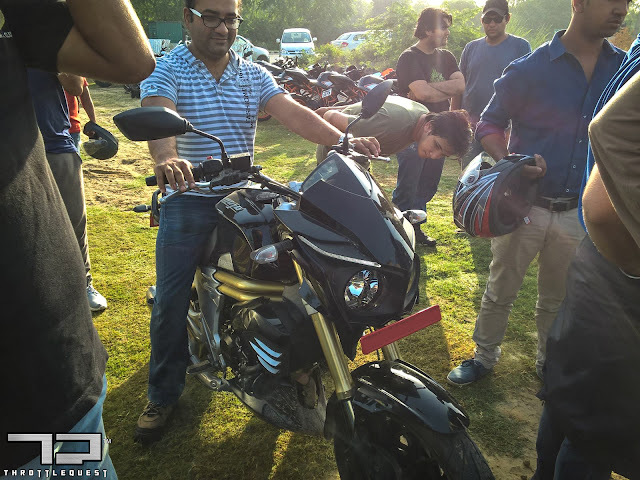 In my first ride, there was a complete lack of feedback from the front end, and the front end felt way too light. I was not at all confident in taking corners or while negotiating traffic. 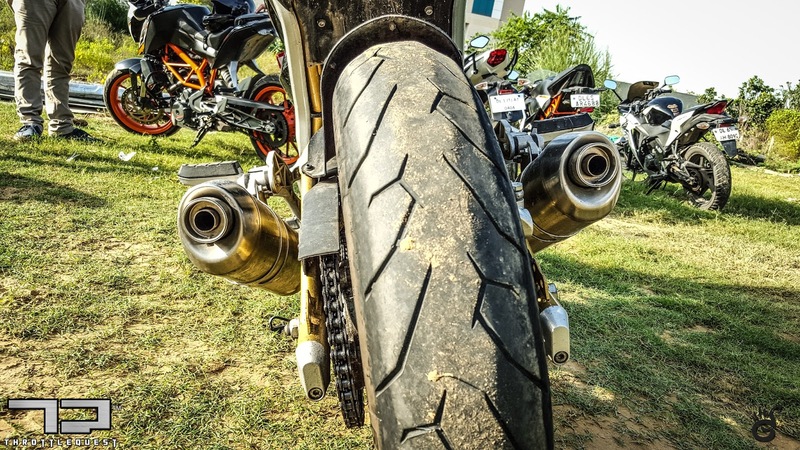 It might be because of the rake angle or the suspension setup or the way the handle bars come over, but either of the these three factors was making for a very nervous front end. Then I got onto a second motorcycle (Mojo that is), and it was a little better. That raises the question, that in both the bikes, the three factors should be the same - rake angle, suspension setup and handlebar setup, then what changed in the second bike!! 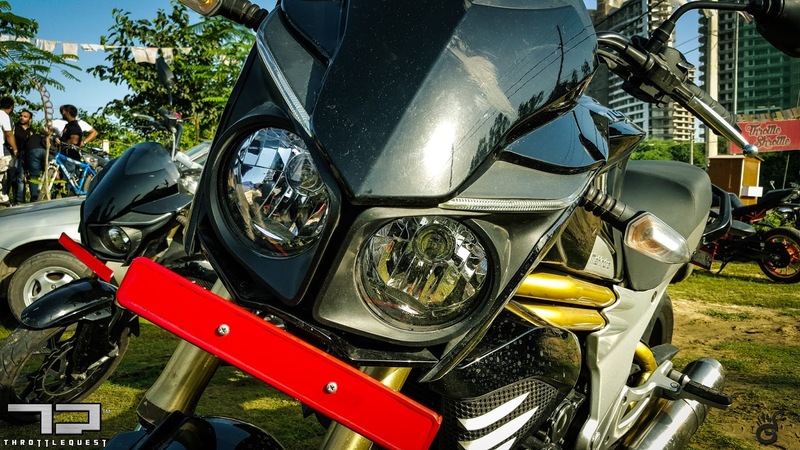 However, the fact remains, the front end doesn't inspire the kind of confidence that a motorcycle of this kind of potential begs for. Speaking about the handle bar, a Yamaha FZ styled short and flatter handle bar, would be definitely apt for the Mojo, which would not only look good on the motorcycle, but also help in the riding dynamics and handling overall. The suspension is soft sprung and makes up for a very plush street ride. The seating is also very comfortable and the back and the bum were happy, really happy with the motorcycle. For the braking dynamics, the 320mm front and the 220mm rear petal discs do a very good job and the initial bite is there, but then again, that confidence is dampened a bit because of the nervous front end, and I ended up using the rear brake more alongside the engine braking for slowing down this otherwise very eager sprinter. Well, on a very first sample, the fit and finish looks quite good. The plastics felt a bit too plasticy and there's way too much plastic panels around, but the good thing is that, there were hardly any panel vibrations even when the motorcycle was revved hard, and that's a very good sign. The instrumentation cluster is a small and sweet one which some nice little touch like the analog tach has it's numbers backlight has you climb on to each individual rev, and also there's a top speed indicator, which was neat!! Honestly, after this much delay, I was not expecting an interesting product, but I was mighty impressed with the Mojo. As I have been saying throughout this post that I was blown away by the engine, and I am not even exaggerating it, but having said that, there are a few things specially with the handling, which I would really like the folks at MTW to have a look and sort it out before the production release happens, which we were told is eminent this October. However, there was one thing, which HAS to change - the way the exhausts come out divided from the downward T divider. Look how close the exhaust pipe is to my right leg. I managed to get leg burnt around that area. Knowing how we tend to use our motorcycles, this is a catastrophy waiting to happen. 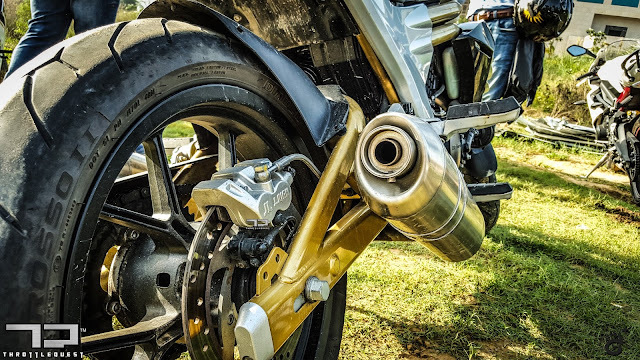 An inverted Y divider should have been used instead of an inverted T divider, which would have allowed the pipes to run under the riders legs and come out from behind the rider's foot pegs. Another small bit is the front face of the motorcycle. It looks unnecessarily bulky. I for one loved the minimalist looks of the first version of the Mojo back in 2010. 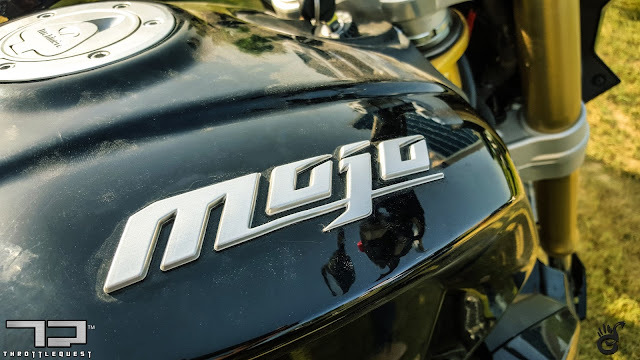 Mojo definitely has it's heart in the right place and it's intent is clear - to be a fun spirited motorcycle, which would give the rider the fun of sports motorcycling with premium touches all around. The execution also is right up there, but needs some attention to details, and I hope MTW is able to make the required alterations to the final production version.